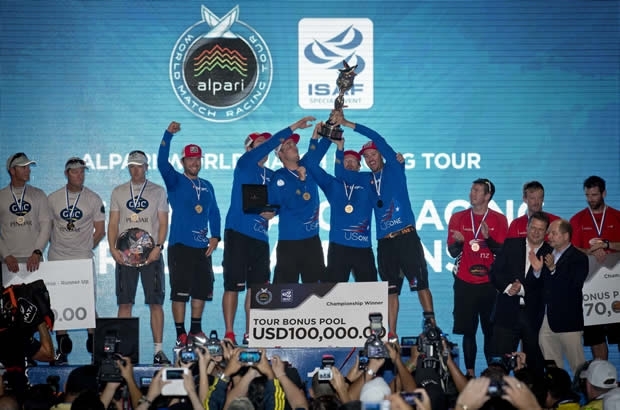 Taylor Canfield has won the Alpari Match Racing World Tour after a dramatic final day at the Monsoon Cup in Malaysia. Canfield has Phil Robertson to thank for his Tour victory after the WAKA Racing skipper swept to a 3-0 win over Ian Williams to take the Monsoon Cup. After a week of frustratingly light winds, overnight some strong breeze hit Kuala Terengganu, even ripping big advertising hoardings out of their concrete mountings and strewing them across the road. Fortunately the strongest wind had abated by race time this morning, ready for the Semi Finals to begin. With the wind blowing from the north east, principal race officer Dave Tallis set the start line up just 100 metres away from the sailing centre, the Ri-Yaz Heritage Marina Resort & Spa, setting up a perfect scenario for the spectators who had come to watch the final four teams do battle. In fact it was so close that in the Semi Final between Ian Williams and Mathieu Richard, the British and French skippers took their battle so close to the pontoons that Richard crashed his boat into the jetty, scarring the starboard side of his Foundation 36 keelboat. Four-time World Champion Williams sailed on to a straightforward 3-1 victory over the GEFCO Match Racing Team. In the other Semi-Final, all Taylor Canfield had to do was dispatch Phil Robertson, book his place in the final of the Monsoon Cup and the World title would be his, regardless of whether or not he was beaten by Williams. After the way Canfield and USone have sailed this week - dominated every stage of the competition and returning as defending Monsoon Cup champions - most observers expected the US Virgin Islander to sail past the New Zealand team in the Semi Finals. But Robertson saw things differently. “We’ve got nothing to lose, these guys have the pressure of a World Championship on the shoulders.” The WAKA Racing skipper made the most of his opportunity and outmanoeuvred Canfield at the starts, winning 3-1. In the deciding match, Robertson crossed the line just 15cm, 0.1 seconds, ahead of the US team. For the first time this week, Canfield’s destiny was out of his hands. His enemy in the Semi Finals would now become his friend as he went up to the Alpari lounge on the top floor of the sailing centre for a grandstand view of the Final. Robertson’s biggest cheerleaders were the team Robertson had just defeated as Canfield’s crew willed the Kiwis to complete the same hatchet job on GAC Pindar that had just been done to them. Things got off to a promising start in the first match when an aggressive luff by Williams at the leeward gate resulted in a penalty against GAC Pindar. Williams led Robertson down the final run but flapped his spinnaker and oversheeted the mainsail in a bid to slow down the contest and wrong-foot the Kiwis into a penalty before the finish. But Robertson refused to be suckered and snuck past Williams for the win. In match two, Williams won the favoured right-hand side of the start and headed out to the paying side. But Robertson sensed something good might yet come from the shore side on the left and gambled on a big split. When they came back together near the windward mark, Robertson had made ground and went to bear away behind Williams’ transom as GAC Pindar went into a dial-down. In the ensuing luffing match, the penalty went against Williams again, and Robertson held on for another win. Match point to the Kiwis. In the third match, Robertson secured a penalty against Williams in the pre-start and although the British led around the three-lap course, the gap was never big enough to shake off the penalty. Again Williams resorted to the big slow-down, but again Robertson avoided the trap and won the race - and the Monsoon Cup. It has been a phenomenal 12 months for Canfield, who has struck up a winning partnership with New Zealand tactician Rod Dawson. “We share the same birthday, 5 February, except Rod’s 20 years older,” said Canfield. “And this is Rod’s fourth world title, same as Williams.” Dawson won a hat trick with Peter Gilmour in 2004, 2005 and 2006. Next year Dawson will go into battle against Williams to see who can become the first sailor to win five match racing world titles. Today was a big payday for the top teams, with Phil Robertson winning US$100,000 for his Monsoon Cup victory plus a Tour bonus of $70,000 for his 3rd overall. Williams won $65,000 as runner-up in Malaysia, plus $80,000 as runner-up in the Tour. Canfield won $48,000 for 3rd at the Monsoon Cup and a $100,000 Tour victory bonus.